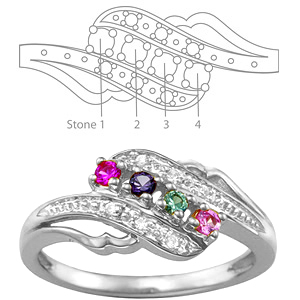 The Jubilee mother's ring is set with 3 to 6 gemstones of your choice. Each round gemstone is 2mm in diameter. For a particularly stunning look, upgrade to diamond accents from cubic zirconia. Six accent stones are always set in each Jubilee ring. Estimated ring top width: 8.16mm. Estimated palm width: 1.65mm. This mother's ring is available with simulated or genuine birthstones.